Welcome to Red Creek Farm! We are a small family-run sheep farm in Mendocino County, California, specializing in fine handspinning fleeces. Tucked away in a corner of Potter Valley, our flock of over 30 sheep spends its summers on irrigated clover pasture, winters on grass and alfalfa hay, and springs ranging in the hills. 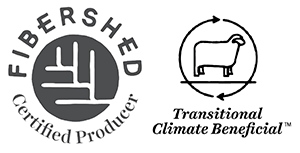 We practice Climate Beneficial methods and are a certified Fibershed producer. We are eagerly awaiting the arrival of the 2019 spring lambs who should be here soon, and whose sire is a handsome Corriedale ram, Gibson, from Nancy Burns's Marble Peaks Ranch. All the ewes have been growing beautiful fleeces and we are looking forward to shearing in April. The gentle rains have been encouraging new spring growth everywhere and the garden is being prepared for more dye plant production.